AMITENDU PALIT. Does Australia need a lesson in Indian economic strategy? 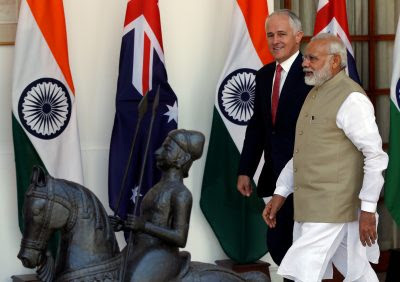 The recently released Indian Economic Strategy to 2035 report outlines three core objectives for improving the Australia–India economic relationship. These include making India one of Australia’s top three export markets by 2035, making India the third-largest Asian recipient of Australian foreign direct investment by the same year and bringing India ‘into the inner circle of Australia’s strategic partnerships and with people-to-people ties as close as any in Asia’.Recommendations for achieving these objectives are driven largely by the choice of states and sectors, 10 each respectively, that the report considers top priority for Australia. The report is candid in its observations and does not fail to consider the challenges that such a pursuit is likely to encounter. But it also emphasises that India is unique in the growth trajectory that it is likely to follow and in the scale of its domestic market (shaped by its youth bulge), which together point to the importance of Australia ramping up its economic engagement with India. Whether the outcomes outlined in the report can be achieved will depend on the interest, sincerity and enthusiasm displayed by businesses, institutions and policy authorities on both sides of the Indian Ocean. Australia’s goal of making India one of its topmost export and investment markets cannot fructify unless India shares the same vision for its own national strategic interests. Unfortunately, there are gaps between Australian and Indian perceptions of the direction of the Indian economy. Domestically, India continues to place faith in a strategy that would enable it to grow into a manufacturing powerhouse. It is rare to come across views from India that argue against India’s efforts to become a hub of labour-intensive manufacturing. The appeal of the view is comprehensive in India, particularly as a strategy of job generation for the millions of youth joining the work force. ‘Make in India’ remains a signature campaign and policy initiative in this respect. In contrast, the Indian Economic Strategy to 2035 report views India principally as an economy that will flourish on the strength of services. Of the focus sectors identified in the report — education, agribusiness, resources, tourism, energy, health, financial services, infrastructure, sport, science and innovation — most are based around services. The report alludes to ‘Make in India’ only from the perspective of defence manufacturing. Identification of the report’s priority sectors is driven jointly by India’s growing need for investment in those sectors and by the ability of Australian businesses and service providers to respond to this need. There is no denying the importance of the report’s priority sectors from an Indian development perspective. But the disconnect between India’s vision for indigenous manufacturing and the pronounced services slant in the report might lead to less enthusiasm on the part of Indian actors. Another potential issue is the report’s geopolitical focus. The report alludes to a geopolitical convergence that necessitates Australia pursuing a proactive Australia–India economic strategy. The two countries’ partnership in the Indo-Pacific is clearly the key element of the stated geopolitical convergence. Australia’s foreign policy and world view is somewhat shaped by an integration of perspectives on foreign policy and international economic relations, particularly trade. Unfortunately, it is not so in India. Security and strategic discussions in India are miles away from economic conversations. Trade policy is hardly shaped in conjunction with foreign policy. Further, the prominence of the Indo-Pacific concept in India remains limited to the security community. Indian trade experts are yet to engage enthusiastically with the concept. It is far-fetched for Australia to expect India to react wholesomely to the report and to endorse a deep and lasting economic partnership with Australia on predominantly geopolitical foundations. The eventual success of the report’s economic strategy requires clarity by Australian agencies and businesses about Indian perceptions on Australia and the world — clarity that is right now limited. In lieu of such expertise, Australian entities’ confusion over Indian policies and economic regulations will continue and the laudable objectives of the report will remain unfulfilled. Amitendu Palit is Senior Research Fellow and Research Lead on trade and economic policy at the Institute of South Asian Studies, National University of Singapore. This article was published by the ANU EAST ASIA FORUM on the 29th of July 2018. It was written by Amitendu Palit. One Response to AMITENDU PALIT. Does Australia need a lesson in Indian economic strategy? The title heading is most appropriate. Yes, reading A. Palit’s article, it does appear that Australia needs a lesson. Our Government’s Indian Economic Strategy to 2035 report is obviously self-centred and self-serving. Probably written by public servants who have never lived and worked or have business or investments in India. If it were written by an honest ‘broker’ it would be predicated on what India as our ‘customer’ wants or needs. Instead it has a self-righteous Australia strategising geopolitically what it can get out of India. Australia should instead focus on the forecast of India being the most populous nation by 2025 and because of its huge talent pool in A.I. and computer technology India will be economically ahead of China by 2050. And so, for India its employment policy will always remain paramount. Economic growth is predicated on its tapping into a humongous English speaking educated computer literate workforce. And thus, the emphasis on economic growth based on ‘services’, as in uplifting the standard of integrity and efficiency of its public service, agricultural & rural sectors and national infrastructure. Insular India need only think Indian! Its overseas diaspora is its geopolitics.